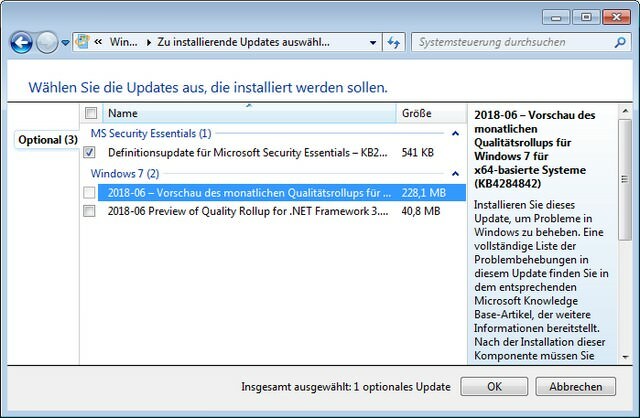 [German]Microsoft has released the preview rollups KB4284842 for Windows 7 SP1 and KB4284863 for Windows 8.1 on June 19, 2018 (Tuesday). Here is an overview of these updates. I don’t know if my observation is correct: Preview Monthly Rollups should be released on the third Tuesday of the month. The current updates are also dated June 19, 2018 in Microsoft’s Update Catalog. But last Tuesday I didn’t find any of these updates during my search. Even today I did not find any Windows updates in the Microsoft History pages. Rather then, I searched through the Microsoft Update Catalog and there were only now (on June 21, 2018) some new updates. Windows Update will also show the availability for June 21, 2018 (Midsummer update). Preview Rollup Updates means a preview of updates that appear on patchday of the following month. These optional updates do not actually need to be installed (unless you are affected by a fixed bug). Updates the Universal CRT to include parity with the Windows 10 Universal CRT build 10.0.14393.0. Addresses an issue that occurs when you enable UNC Hardened Access with RequireMutualAuthentication=1 after installing KB3000483. Windows 7 SP1 DFS clients that authenticate to 802.1x WLAN Access Points will fail to apply Group Policies, run scripts at user logon, or receive roaming user profiles. Addresses an issue that prevents customers from accessing protected keys after changing an Azure Active Directory or domain password while offline. This issue may prevent customers from decrypting encrypted documents and from authenticating when connecting to online resources. Addresses an encoding issue with the Bitcoin symbol. 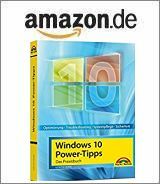 The update is optional and is offered via Windows Update, but can also be downloaded and installed via Microsoft Update Catalog. This update has an issue, known from previous patches, that the network adapter (NIC) may be lost on some machines. The workaround is to reinstall the NIC driver in the device manager. My advice is to stay away from this update. Addresses encoding issue with the Bitcoin symbol. Addresses an issue in which SmartHeap doesn’t work with UCRT. Addresses an issue that sometimes prevents eDrives from unlocking when an eDrive is a secondary drive and the system drive is protected with BitLocker. Addresses an issue in dfsutil.exe that occurs when exporting a DFS namespace as an XML file. The issue occurs when the namespace contains a link with a target that points to a shared folder that has an “&” character in its name. As a result, the generated XML doesn’t correctly escape the “&” character, and dfsutil.exe cannot export the namespace. Addresses an issue where a clustered SMB server may become unresponsive in certain conditions when under a high workload. Addresses an issue where the user profile service leaks a token handle. Token leaks on computers that install MS16-111 (KB3175024) intentionally consume a session. Token and session leaks, in sufficient volume, can degrade device performance and reliability with increased system uptime. This is especially true on RDP and Kiosk computers that have a large number of user logons. The update is optional and is offered via Windows Update, but can also be downloaded and installed via Microsoft Update Catalog. Microsoft is not aware of any known issues update yet. This entry was posted in Update, Windows and tagged KB4284842, KB4284863, Update, Windows 7, Windows 8.1. Bookmark the permalink.